ClientExec est une application de gestion de client et facturation. ClientExec a été initialement publié en 2002 et aujourd'hui des milliers d'entreprises lui font confiance. Fixed false positive being detected when Clientexec is in a sub-directory of WordPress with the WordFence plugin. Fixed tickets user for "Automatic Cancellation of PayPal Subscription Failed". Fixed issue with the loading of the "Advanced and Plugin Settings" panel when using CloudFlare. Fixed email testing when using "Ignore Invalid Mail Server SSL". Fixed possible issue with adding/updating a staff member causing a PHP error. Fixed some broken permissions when editing a customer. Updated polyfill for EventSource to Live Chat works properly in IE and Edge. Fixed issue with email testing when a language other than English is used. Added custom fields tab to admin add support ticket. 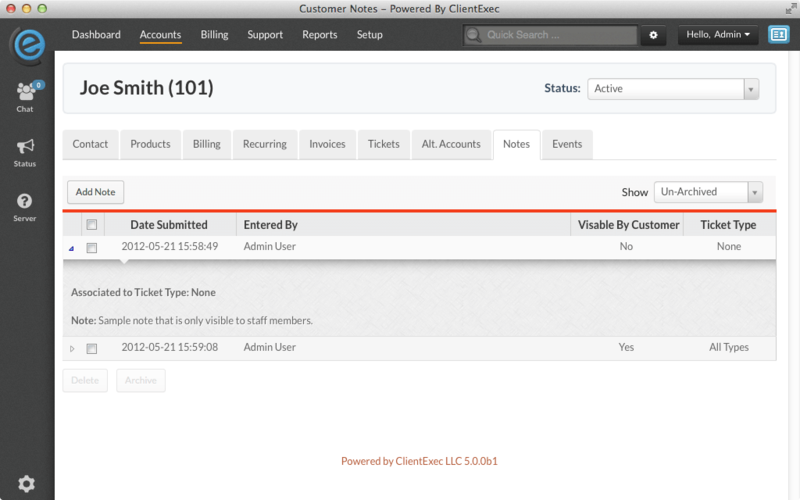 CC and BCC custom fields in add support ticket will now also email the first ticket message. Added event logs when requested to reset password. Added event logs when resetting the password. Moved the description for a password setting field under the setting name. All public (frontend/client side) controller files are now not encoded. Added 3 days timeout to reset local attributes, if can not connect to License Defender. Updated invalid license page to check if the license is valid (and redirect back to index.php), on page refresh. Added event listeners for: Client-Create, Client-Update, Client-Delete, UserPackage-Activate. 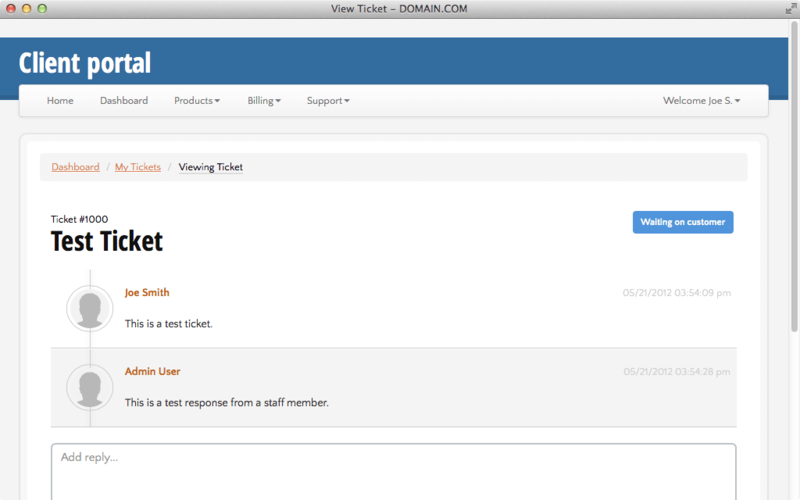 Allow an admin email & password to be validated with the validate user API resource. PDF invoice will now only display Tax Columns if customer is Taxable and has a matching tax rule. Added new billing setting "Recalculate Next Due Dates Related To Packages". Added new API resources to add and update a recurring fee. 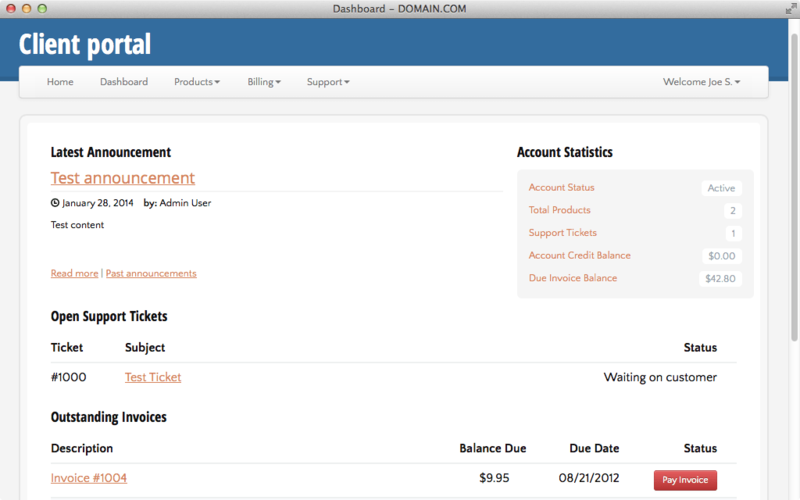 Added new API resources to add and update an invoice. 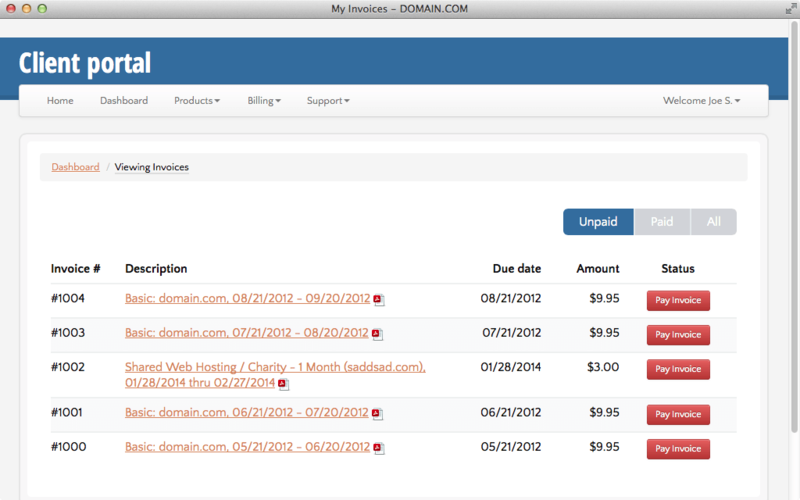 Added new API resources to get an invoice and all invoices. Ensure invoice status names can be translated. Avoid generating new invoices from recurring fees related to pending packages that already has an unpaid invoice. Fixed issue to configure domain addon 3 years price. Fixed Paypal refunds on partial payments. Updated the invoice reminder summary email to show the full name (and organization) of the client attached to each email that was sent out. Added new PayStack Payment Gateway. Ensure the proper currency code is sent to 2CheckOut. Log a proper event error if CE's IP has not been properly added to eNom's API whitelist. Ensure that the TeamSpeak3 server is started after it has been unsuspended. Updated TeamSpeak3 plugin actions to be based on the status of the TeamSpeak3 Server. Fixed Authorize.net CIM to properly work in signup. 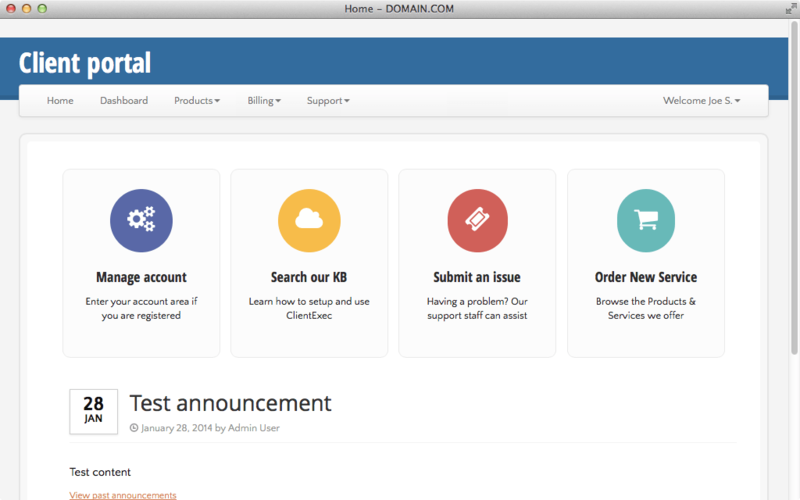 Updated cPanel username checking to allow for usernames up to 16 characters in length. Updated "package not found" error message in cPanel to explain about resource limitations. Fixed Stripe Checkout gateway plugin to avoid creating a customer per payment. Added new importer for Blesta. Updated Quantum and QuantumVault plugins to work with new API changes. Fixed issue when applying credit from signup. Fixed issue with "Free Domain" not properly working when having "Hide hosting custom fields" enabled. Allow the full domain name to be passed as the GET param "domainName" instead of "domainName" and "tld". Fixed issue in signup using the wrong package when cancelling an order before reaching summary, and then selecting a different package. Updated "Overdue Invoices" Report to show the full client name, instead of just the client ID. Fixed possible issue with the rate ticket hash being invalidated if a ticket is reopened and closed multiple times. Fixed issue with ticket display when the ticket has ticket logs assigned to a package that was deleted. Fixed support ticket file attachments to avoid issues with unwanted spaces in "Allowed File Extensions" before checking file extension when attaching a file. 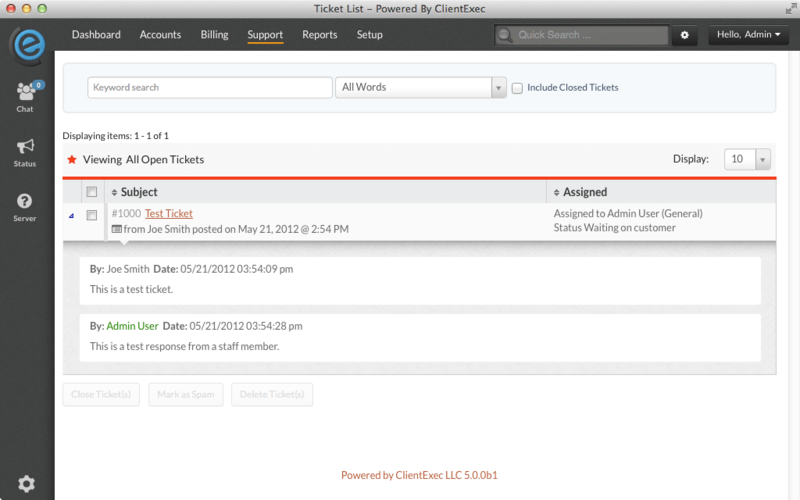 Added "Last Reply" column to support ticket list. Implemented a tweet button on the support ticket feedback page, when a ticket has been rated as excellent. 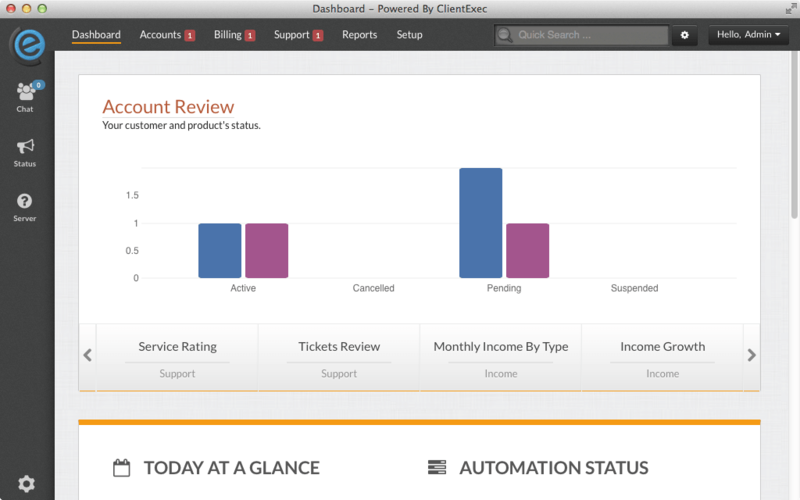 Fixed language call for ticket status on public client dashboard. Fixed possible issue with ticket logs if the name is longer then 35 characters. Added new setting to determine how many "Top Questions" are shown when a ticket type is selected, when submitting a new ticket. Allow a staff member to create guests users from the users list. Redirect to the client's profile after successful creation from users list. Allow guests to be filtered on users list. Updated events list to show the reason a client requested cancellation. Fixed possible issue with client side host records tab of a domain package. Ensure the default country is set to a new user upon account registration. If an invoice entry has start and end dates, include them in the INVOICEDESCRIPTION email template tag (AP).